The Air Canada Altitude program for 2019 does not seem to have changed very much from the 2018 program. In order to qualify for the 2020 year, there have only been a couple of changes. One these changes is actually a very positive one for fliers who are earning lower tiers. As mentioned above, the Early Recognition benefit now applies to all tiers including Altitude Prestige 25K. Previously it started at the Elite 35K level. 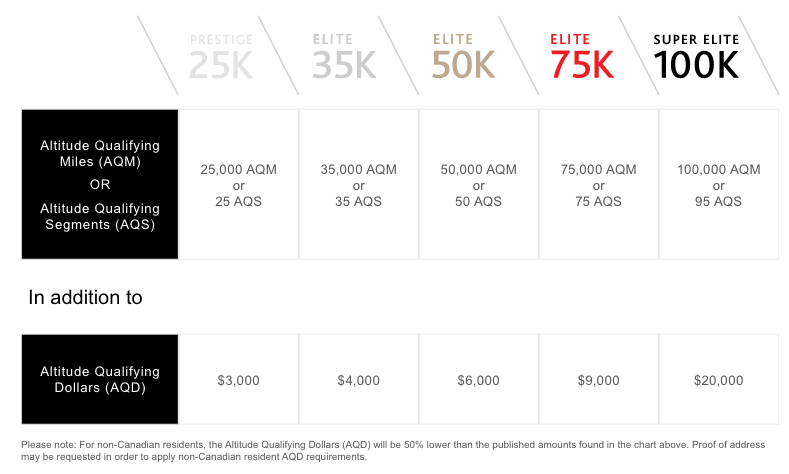 For example, if you were a non-Elite member at the beginning of the year, and you achieve the required Altitude Qualifying Mile (AQM) or Altitude Qualifying Segments (AQS) and Altitude Qualifying Dollars (AQD) by August 5th, you would immediately reap the benefits of becoming a Prestige 25K member. Some of the most noticeable benefits of achieving this level from not having status are: Priority Airport Check-in, Advanced boarding and possibly most beneficial, an increased baggage allowance. You would now have a guaranteed allowance of 2 bags (23kg) as opposed to having your baggage allowance determined by the type of fare purchased. In addition, you will receive 20 eUpgrade credits. 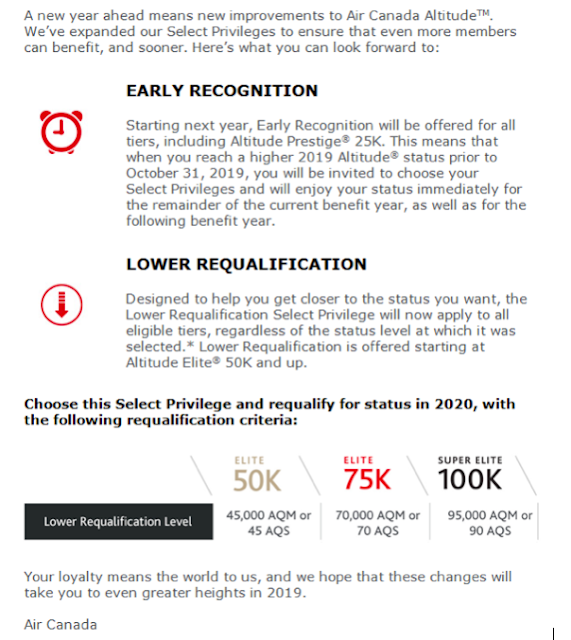 If you achieve the next level (still prior to October 31st, 2019), you will be bumped up to that level for the balance of the year and receive the additional benefits that come with the new level. The only other change is just to wording on the Priority Rewards benefits. These were described as “2x Classic Rate” in 2018 and now “2x Fixed Mileage Rate” for 2019. The redeeming procedure remains the same. I think that Air Canada is holding the line on how the current program operates as they are busy preparing the new program ready to commence in June 2020. From a business perspective, it certainly make sense to leave the current program as is and concentrate on ensuring that the new program rolls out without a hitch. Aeroplan Miles will be transferable 1:1 into the new Air Canada loyalty program in 2020. There will be no changes to lounge access privileges offered to Altitude members and Business Class customers. Your Altitude status is independent from Aeroplan and the ability to earn or maintain status is not affected by this change. There are no changes planned to the Million Mile status when the new program launches. All earnings that go to your Altitude Million Mile status will be carried forward to the new program. Aeroplan members can continue to earn Aeroplan Miles with their Aeroplan credit cards, and redeem miles on a range of Aeroplan Rewards, including travel with Air Canada and the Star Alliance member airlines through June 2020. There absolutely will be credit card partnerships with the new program. More details will be announced closer to when the new program is launched. (American Express is as yet not confirmed). With the new program you will be able to earn and redeem miles with Star Alliance partners and other partner airlines. Currently, the Aeroplan program allows you to transfer miles to a friend or family member for a fee. Air Canada recognizes that enabling this kind of flexibility will definitely be important when building the new program, particularly if it’s valued and appreciated by their customers. More details will be provided as it gets closer to the launch date of the program. One of the things that would probably be most welcomed in the new program would be if the “taxes, fees & surcharges” would be lowered (Air Canada fees tend to be much higher than other Star Alliance carriers). Personally, I think that as Air Canada will now be overseeing and maintain the program themselves, it may allow for more flexibility in changing or adding benefits as they will not have to seek third party approval as was most likely the case with Aimia. It will remain to be seen how the new program compares to Aeroplan when it rolls out. Hopefully it will be a smooth transition and a positive experience for all.